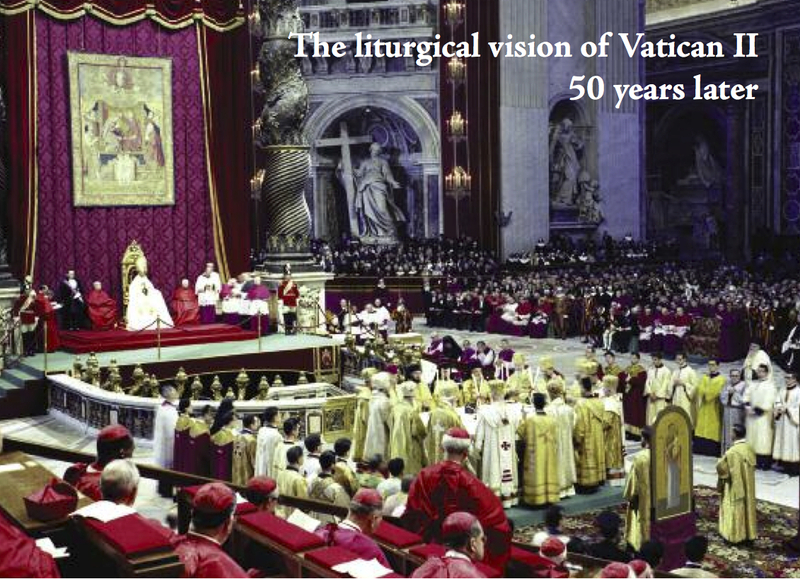 Dec. 3, 2013, marks the 50th anniversary of the Second Vatican Council’s “Constitution on the Sacred Liturgy” (“Sacrosanctum Concilium”). Arguably the most practical outcome of that extraordinary event in the life of the church, the reform and renewal of Catholic liturgy is something whose meaning is still debated, as a number of recent studies have shown. How has the church’s worship fared in these past 50 years? The results since the council have been fairly mixed. The many provisions of the constitution on the liturgy are directed toward three major goals: 1) full, conscious and active participation by all involved in the celebration of the liturgy (No. 14); 2) structural revision of liturgical rites (Nos. 21 and 23); 3) most important, recognition that the liturgy is the work of Christ himself and that the church itself is most fully realized when the Eucharist is celebrated (Nos. 5 to 10). The first and third goals belong together, since the document affirms that full participation is integral to the liturgy because all the faithful participate by virtue of their baptism. A profound theology of the church based on baptism and the common priesthood of the faith- ful undergirds the whole document, one that the historian Massimo Faggioli has argued was not adequately embodied in the other constitutions and decrees of the council. The theological vision of Vatican II, which itself was the fruit of over a century of historical retrieval (ressourcement) and critical study of the liturgies of the past, is very much at the center of the debates about the liturgy today. One of the urgent issues that this theology raises is a better understanding of the relationship between the baptismal priesthood and the priesthood of the ordained. The second goal, the structural revision of liturgical rites, is related to the other two. The framers of the constitution realized that the rites themselves needed revision so that their theological meaning could be appreciated anew. That process had been inspired by the first liturgical encyclical of the modern era, Pope Pius XII’s “Mediator Dei” (1947), and by the establishment of a commission for liturgical reform the following year. Some results had already been realized by the time of the council: the revision of the Holy Week ceremonies, the relaxation of fasting regultions, permission for evening Mass and the increase in so-called dialogue Masses, in which the people responded to the priest (in Latin) and sang parts of the Mass. But the council had in mind an even more radical reform that would clear away much of the debris that had (inevitably) accumulated over the centuries and would look to adapt the liturgy to contemporary culture—as long as organic continuity with the past was respected (No. 23). The actual shape of the subsequent reform and liturgical reformers’ understanding of modernity were to become controversial. Some council documents, like “Sacrosanctum Concilium,” needed to be complemented by further legislation and pas- toral implementation. The task of putting flesh on the structure provided by the constitution was given to the Consilium, a group of bishops and expert advisors who began work immediately. The sheer scope of their work, completed within only 10 years, is awesome. Here we can highlight four significant areas of change: the use of the vernacular, the reorientation of the church building, the expansion of ministerial participation and the restructuring of the liturgical year. The most obvious consequence of the constitution was the permission to use the vernacular for certain parts of the eucharistic liturgy. The Consilium and Pope Paul VI himself quickly found that translating the entirety of the liturgy into the vernacular was desirable. If conscious participation was ever to come about, this move was inevitable. Part and parcel of translating the liturgy was the desire to open up the treasury of the Scriptures. The liturgical movement and the new Catholic appreciation of the Bible went hand in hand. Recent years have seen a struggle to find appropriate lan- guage for liturgical celebration. In English we seem to have moved from a rather loose and somewhat uninspiring translation to a text that is stilted and filled with awkward archaisms (consub- stantial, chalice). One can hope that a future translation will find a happy medium and expand the body of prayers with original compositions, as the U.S. bishops and other episcopal conferences had proposed with the 1997 translation by the International Commission on English in the Liturgy. If the use of the people’s language was the most significant reform inspired by the council, the rearrangement of church space was a close second. Even before the council had ended, a first instruction implementing the reform mandated that the main altar of any church at which the Eucharist was celebrated needed to be free-standing so that the presiding priest could stand on the side facing the people. What resulted was a remarkable shift in the popular understanding of the liturgy. Now it became clear that the celebration was communal and called for active participation. The change did, however, bring with it a peril because of the possible focus on the personality of the priest instead of on the liturgy itself. A vigorous debate, spurred on by a movement often referred to as the “reform of the reform,” continues. As is the case with language, balance needs to be sought in church architecture and arrangement. Some of the newer church constructions clearly lack the beauty and elegance required for worship of a God who transcends our world while at the same time dwelling among us. Other church buildings that were designed with a very different liturgy in mind have suffered from weak and sometimes misguided renovations. Catholic communities deserve spaces that both inspire full, conscious and active participation and invite us to a deeper relationship with the God who is always beyond our grasp. A third area of reform is the noteworthy expansion of liturgical ministries. Properly celebrated, the post-Vatican liturgy requires a number of ministers: deacons, readers, acolytes, musicians, servers and extraordinary minis- ters of Communion. There were deacons at the old solemn high Masses before the council, but they were usually priests who simply dressed the part. The council reinstituted the permanent diaconate, which made it possible for married men to be ordained in the Latin rite and, even if unintentionally, opened the door for what are now called lay ecclesial ministers, who may not minister at the altar but have become a significant part of the church landscape. The priest shortage as well as regularly offering Communion from the cup led to the need for more ministers and the institution of lay ministers of Communion. What official legislation still deems extraordinary—lay ministers are only called for when there are not enough priests available to distribute Communion—now seems normal in most parish celebrations. Lay ministers of Communion are an important symbolic element in the coordinated array of ministers that the liturgy requires. Another aspect of the liturgy that was changed significantly after the Second Vatican Council is the rearrangement of the liturgical year. Sunday was restored to its pride of place in Christian celebration since it is our pri- mary celebration of the passion, death and resur- rection of the Lord (the paschal mystery). The integrity of the 50 days of Easter has been emphasized. The number and ranking of saints’ days has been dramatically reduced. Lent now has a twofold focus: Christian initiation and the renewal of that initiation through penance. Along with the reform of the liturgical calendar came a much richer approach to the Lectionary, with a three-year cycle of readings for Sundays and major feasts (including much more of the Old Testament than had ever before been read in the Roman Rite) and proper readings for weekdays. Previously only Lent had a series of weekday readings. Of course, in contemporary society the liturgical calendar competes with all sorts of other calendars (educational, civic, seasonal), but it seems to be working, even if subtly, to form a generation of Catholics. Only time will tell. The post-Vatican II liturgical reform has not been without its critics and its challenges. The “reform of the reform” movement had Pope Emeritus Benedict XVI as one of its champions. Pope Benedict encouraged both a rethinking of the disposition of church spaces (turning the priest’s posi- tion once again to the “east”—that is, facing away from the people) and a revival of the pre-Vatican II Latin liturgy, which he named the “extraordinary form.” What at first seemed to be an accommodation for a minority who wished to celebrate the old form now seems to have become a growing trend, with some seminaries actively training future priests to celebrate the older rite and some groups actively encouraging its spread. It is very difficult not to regard this development as somewhat divisive. No doubt some of the roots of the movement lie in a shoddy and devil-may-care implementation of the liturgical reform, an external reform that was not accompanied by an interior renewal. On the other hand, the older liturgy is clearly symbolic of a vision of church, theology and the world that the Second Vatican Council consciously moved away from in some very important ways. It is not for nothing that the most recalcitrant followers of Archbishop Marcel Lefebvre, founder of the St. Pius X Society, join their love of the Latin liturgy to a profound suspicion, if not denial, of the council’s declaration on religious freedom and its general mood of welcoming conversation with the modern world. In other words, opting for the older liturgy often bespeaks a rejection of Vatican II and all that the council brought with it. As Massimo Faggioli has convincingly pointed out, to reject the liturgy that resulted from the Vatican II constitution is to reject the council itself. The election of Pope Francis may well open a new chapter in the postconciliar debates on the liturgy. If the first liturgical celebrations of his pontificate are any indication, he may at least temper the fervor of those who have been most critical of the reforms. His actions seem to show him in favor of the newer liturgy and its greater simplicity. So the post-Vatican II reform will probably proceed apace. But with regard to the major goals of “Sacrosanctum Concilium,” the reform is far from over. Surely there are a good number of Catholic communities where the council’s renewed vision of the liturgy has been assimilated and celebrated, but there are far too many in which the message has been digested only halfheartedly or without a profoundly interiorized appreciation of that vision’s implications. The task going forward is twofold. First, every effort should be made to ensure that our liturgical celebrations are truly reverent. This does not require that liturgies be celebrated with medieval choreography and lots of lace; it does mean that they must be carefully prepared and prayerfully celebrated. The style of the liturgy is not of primary importance. The post-Vatican II liturgy can be celebrated in any number of cultural contexts, but their common denominator needs to be reverence. The second task is considerably more challenging. Catholics need to be helped to understand more deeply and more explicitly the connections between their lives and what they celebrate in church. As the great contemporary liturgical historian, Robert Taft, S.J., has said: “The liturgy is the Christian life in a nutshell.” Nothing more— but nothing less. Our liturgies themselves, albeit in a ritualized fashion, play out the way we are called to live. They are the summit of Christian living as well as its source. As that reality enters more deeply into the Catholic consciousness, we will achieve by God’s grace the full, conscious and active participation the council called for, and we will be on our way to celebrating more fully the baptismal priesthood we are called to live. This article also appeared in print, under the headline "An Active Presence," in the May 27, 2013 issue. John F. Baldovin, S.J., is professor of liturgical and historical theology at Boston College. His most recent book is Reforming the Liturgy: A Response to the Critics (Liturgical Press, 2008).